Alghanim Lotus unveiled the legendary and globally acclaimed Lotus Evora 400 2018 at Arraya Mall during the month of September, bringing visitors and car enthusiasts closer to the top-of-the-range sports car, which has redefined driving, speed and pure advanced engineering. Always committing to adding value to customers’ experience and providing them with the best quality of service and products, Alghanim Lotus launches an exclusive offer during the unveiling, giving customers competitive financing solutions starting from KD625 monthly installments, in addition to the threeyear unlimited mileage warranty which includes three years of free service and a one-year full coverage insurance policy for free. The exclusive offering runs throughout the duration of the exhibition until the end of the month of September, giving customers a once-in-a-lifetime opportunity to own of the limited number of Lotus Evora 400 handbuilt this year. About the legendary Evora 400 The new Lotus Evora 400 is one of the latest pure and focused supercars engineered by Lotus, combining high performance with the legendary Lotus benchmark handling. 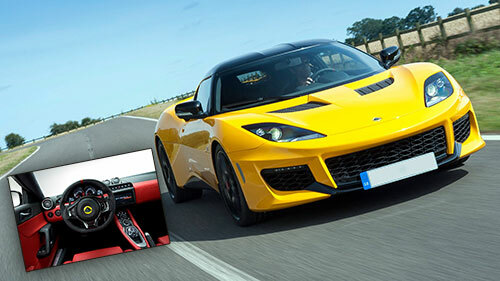 With a maximum speed of 300 kilometers per hour, and an acceleration of 0-100 kilometers in 4.2 seconds, the new Evora is a more agile and involving drive that enables it to lap the challenging test track at the Lotus Headquarters in Hethel, Norfolk at a scintillating six seconds faster than previous models. Over two thirds of the Lotus Evora 400 is new, including its supercharged and charge-cooled mid-mounted 3.5-liter V6 engine that produces a horsepower of 400 and 410 Nm of torque. A new aluminum chassis incorporates a new interior, and the lightweight composite body has changed significantly both in the front and rear of the miracle car. The new Evora is 22 kilograms lighter, an accomplishment that has been achieved through careful and clever design and attention to details. This weight reduction is even more impressive considering that the supercar has more power and a higher standard specification than before. Alghanim Motors, the mother company of Alghanim Lotus, is dedicated to providing customers with superior products, outstanding services and features that continue to position the company as a leader in the automotive market. Experience the purity of speed and unique experience of the 2018 model of Lotus Evora 400 by visiting Arraya Mall in Sharq, Kuwait City, before the end of the month to take advantage of an unprecedented sportscar engineering experience and exclusive offers.